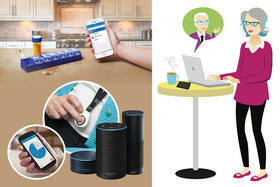 A version of this article originally appeared in the Summer 2018 issue of OUR HOMES London and Middlesex County, p.18. Find local businesses in our London directory. Spending time in an interior that has been professionally curated and designed is always a treat, especially when the home happens to belong to the designer herself. 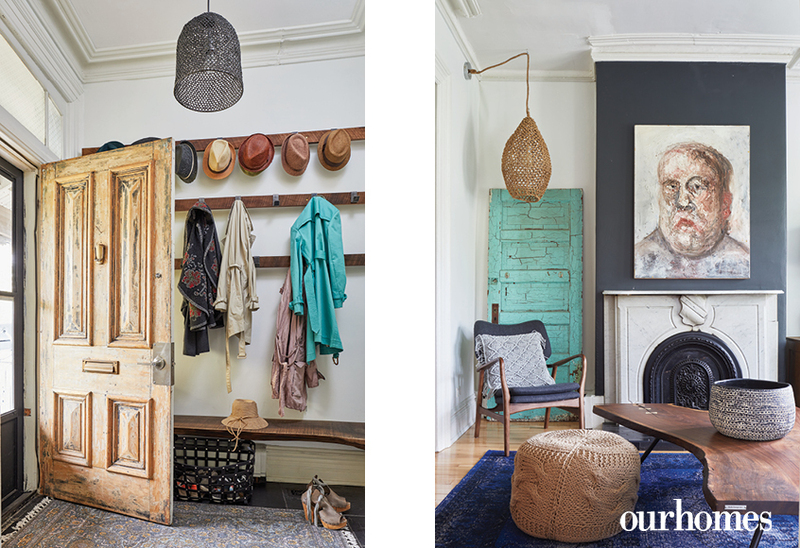 Sylvie Roth of Sylvie’s Interior Design invited OUR HOMES to poke around her Victorian era cottage in London’s Old North. 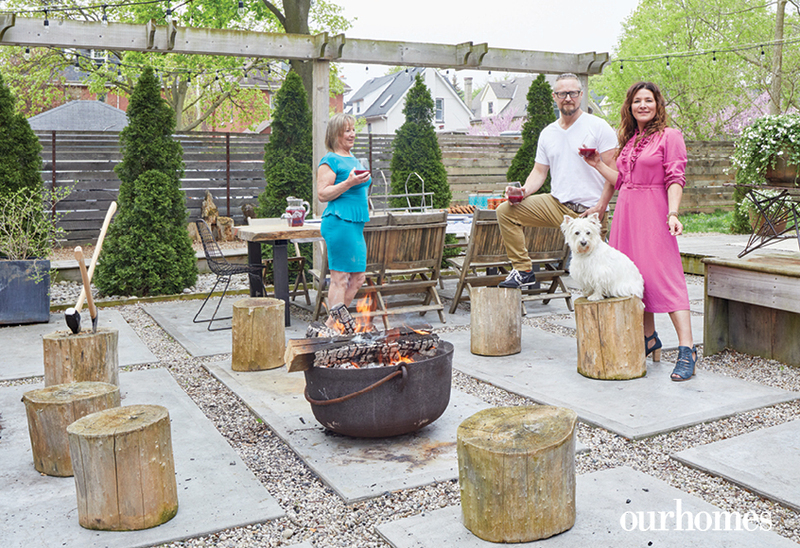 We spoke with Sylvie about her recent reno and the decidedly bohemian – aka boho – style she brought with her from Montreal. Carefree, vintage-loving, layered and art-centred, it’s a signature look that she’s added to many other London interiors over the past 12 years. My husband, Andy Roth, bought it 20 years ago. He loved the location, in the core but at the end of a dead-end street so there’s not a lot of traffic. An added feature was the very large lot. Originally there were three apartments in the house, and we continue to have a tenant upstairs. When I moved in after we got married 11 years ago, the house was pretty beat up. We’ve been renovating ever since. 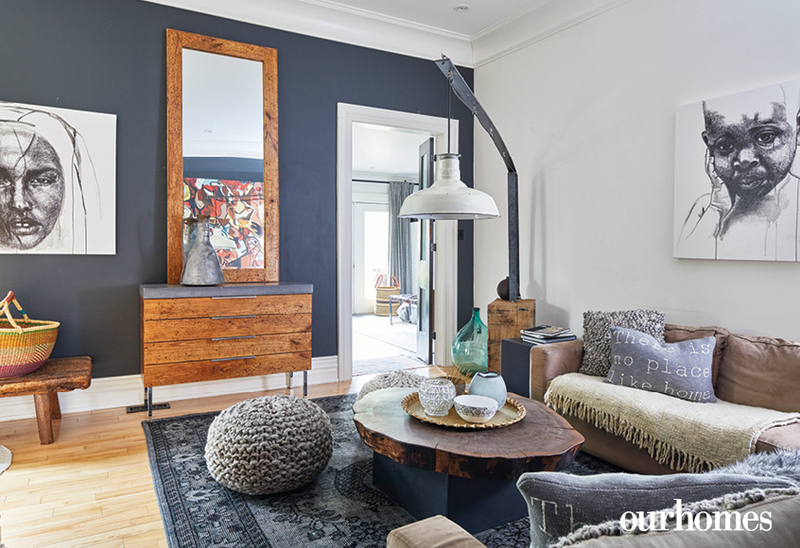 How did you get your place ready to live in… and decorate? 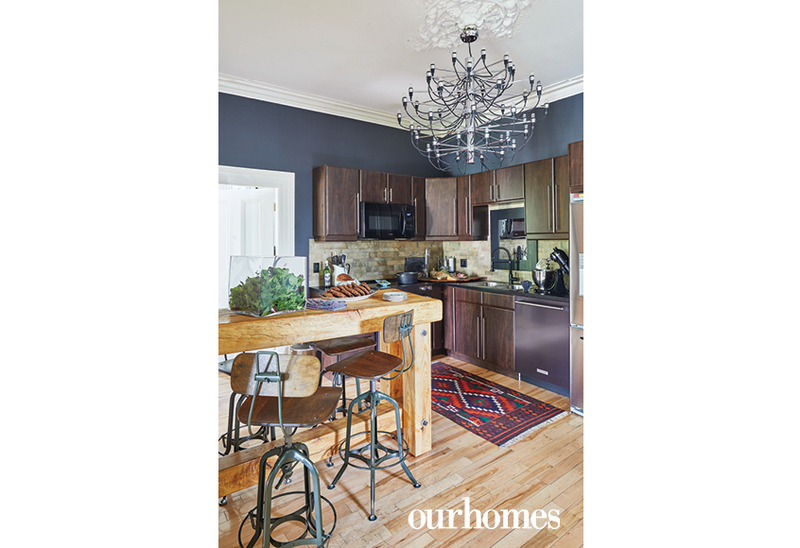 We started by turning the two main-floor apartments into one, giving us around 1,600 square feet of living space. We knocked down some walls and we stripped most of the original doors. I love the weathered look they have now. Since it is a Victorian home, we added crown mouldings in the rooms we gutted. They match original mouldings in the other rooms. New maple floors and new windows (Copp’s Buildall) made the place more liveable. Of course we also had to replace wiring and put in a new heating and cooling system. For a while you lived in another old cottage, but came back here almost a year ago. What have you done since moving back in? We made our front entryway more functional by adding a bench and built-in shelving by Roth Design Inc., and Andy has also put in two gorgeous bathroom vanities that look fantastic paired with fixtures from Aqualuxe Bath Showroom. We have repainted throughout with three of my favourite Benjamin Moore colours from Clancy’s Rainbow - Oxford White, Wrought Iron and Racoon Fur. They show art beautifully, and I do love original art! In fact, it’s hard for me not to buy it. I would rather have a blank wall than a reproduction. I love working with artists, especially Biljana Vujicic and Vanessa Zita Vanderider, both from London. I relate to their stories and their passion, and I enjoy promoting their work. How would you describe your home now? Very simple, but very eclectic. My house is filled with pieces that I’ve had for years. I don’t get rid of much and my style really hasn’t ever changed. I go for materials that are never going to date. I love mostly raw materials, like wood and concrete. Iron, too. Andy has framed all our mirrors using angle iron. I love their rusticity. What are the chief elements of boho? 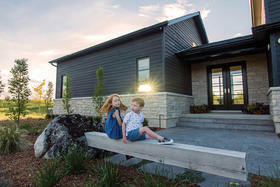 What have you prioritized during your renovations? Flow is very important in a home. There should be no forbidden areas. We knocked out walls to create easy movement and sight lines between our main living areas. Of course we also had to work within certain limitations. I need a big office and work room, but I also need a big room to store my clothes. There wasn’t enough space to have both so now I’ve got a combination dressing room/office, which works great! 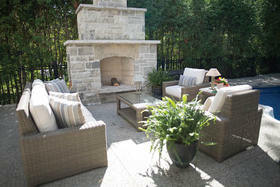 Another “limitation” is that our master bedroom provides the only access from the house to our outdoor living space. But that’s ok. It’s a big, airy room with french doors. I just treat it as another beautiful room to experience while on my way outside. 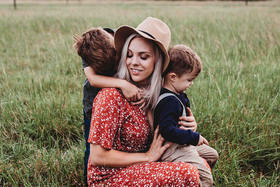 How have you taken your boho style outdoors? Do you have any future plans for the house? We plan to renovate the kitchen in the near future. In the meantime, we’ve got great new appliances (London Major Appliances) as well as a fabulous pantry just off the kitchen where I store my vintage platters. When we renovate we will build a Scandinavian-style glass-and-steel frame wall between the kitchen and pantry. We’ve done a lot here, and continue to do so, which is why we plan to stay forever. The salvaged heavy wood front door has been stripped of its many layers of paint to leave a character-filled patina. 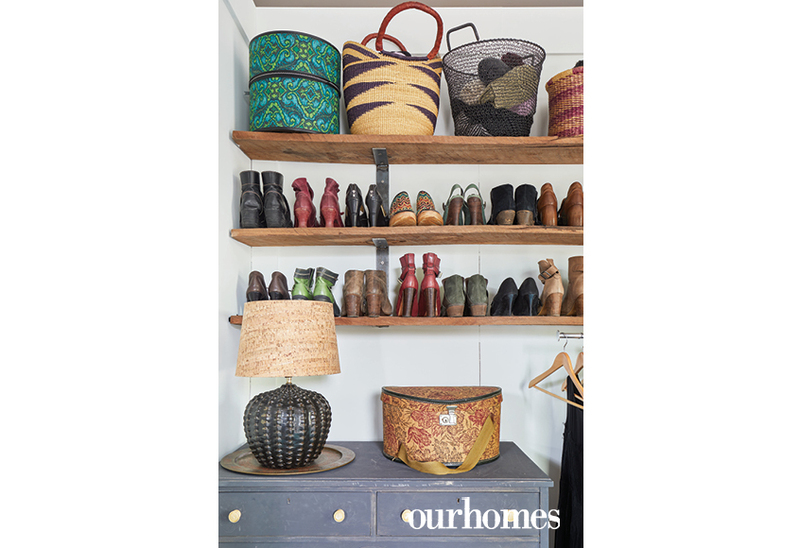 Inside the entry, three strips of iron hooks offer amply room for coats and a collection of fedoras. In the living room, an indigo blue rug grounds the room while designer Sylvie Roth introduces texture in a pouf, woven pillow and wicker lamp. Numerous portraits by artist Biljana Vujicic fill the home. The den leads to the master bedroom as well as an office and dressing room. 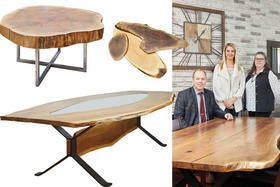 Benjamin Moore paint in Raccoon Fur is the backdrop for art as well as Andy Roth’s wood furniture creations. The sofa wall is painted Oxford White. 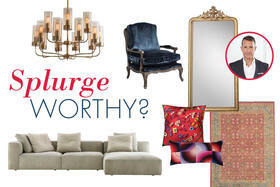 Lots of blankets, pillows, baskets and poufs are signature boho. Vibrant art and warm wood create a cosy ambience for dining. Sylvie plans to redo the kitchen soon, replacing the present island with a much larger one and creating the same vibe with the beauty of repurposed materials where possible. 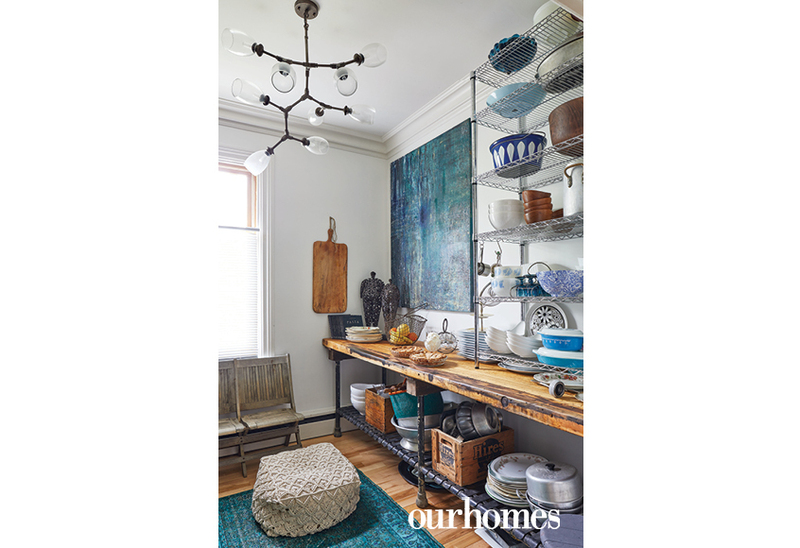 An heirloom bench in the pantry invites company to watch the pastry chef roll out pie dough atop an old workbench, amid the pleasant clutter of vintage platters and bowls. 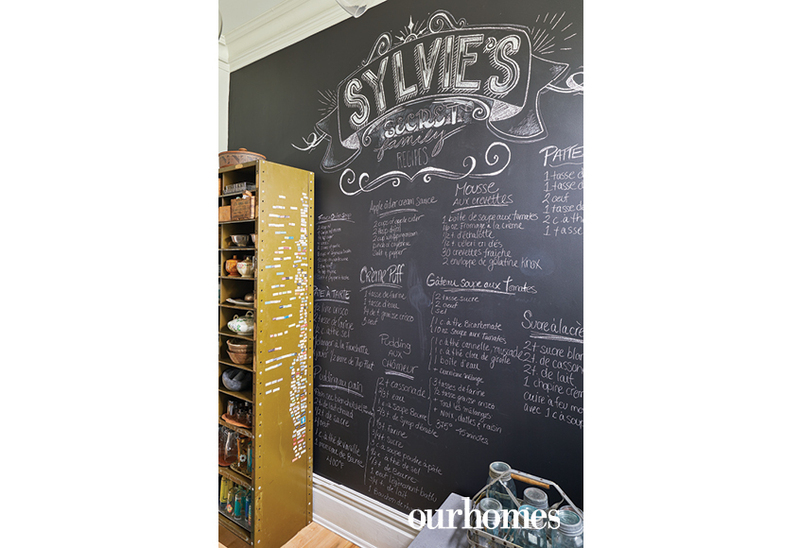 Sylvie transcribed favourite Quebecois recipes onto the pantry’s chalkboard wall. A sliding metal door separates the den from the office where decorator supplies and samples are housed. 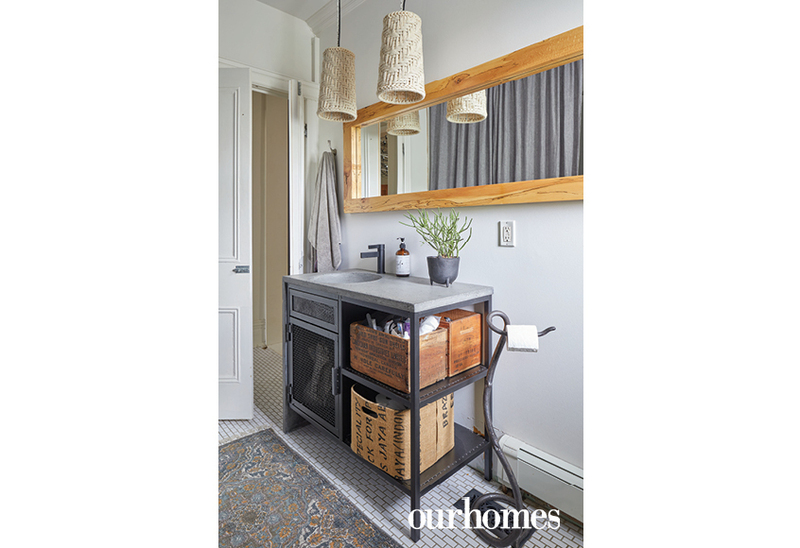 The main bathroom repeats the blend of natural materials found throughout the home, here with concrete, wood, metal and woven rope lamp shades. 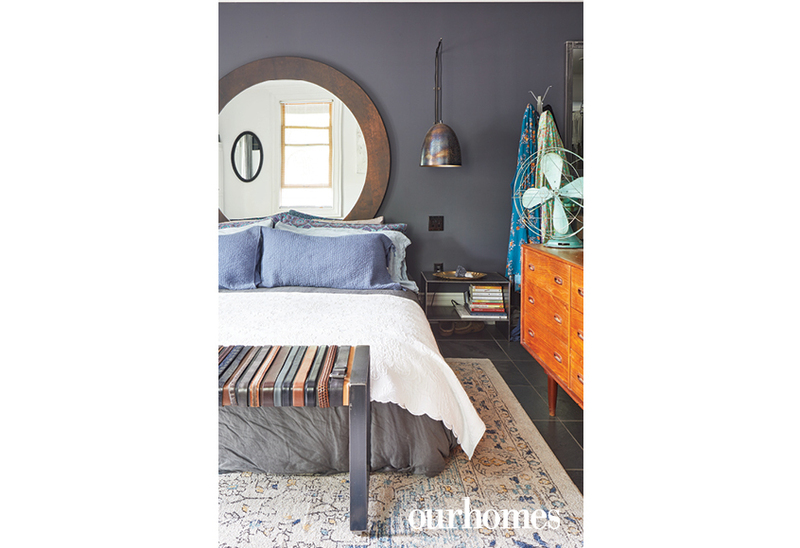 One of Sylvie’s signature benches, repurposing leather belts pulled taught on an iron frame, graces the foot of the bed in the master bedroom. Luxurious yet unmatched linens finish the room with boho charm. Part of the home office is a spacious dressing room. Vintage storage baskets and boxes, woven baskets and bowls and a leather basket chair with braided contours add decorative punch. 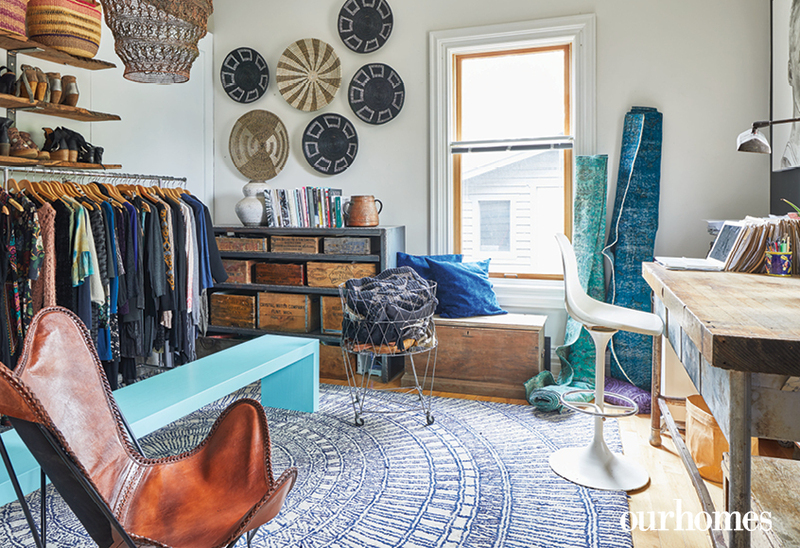 Storage is a serious part of the room’s décor. An oversize mirror creates the feeling of space in the master bath where Andy built the substantial coffee-bean stained oak vanity. 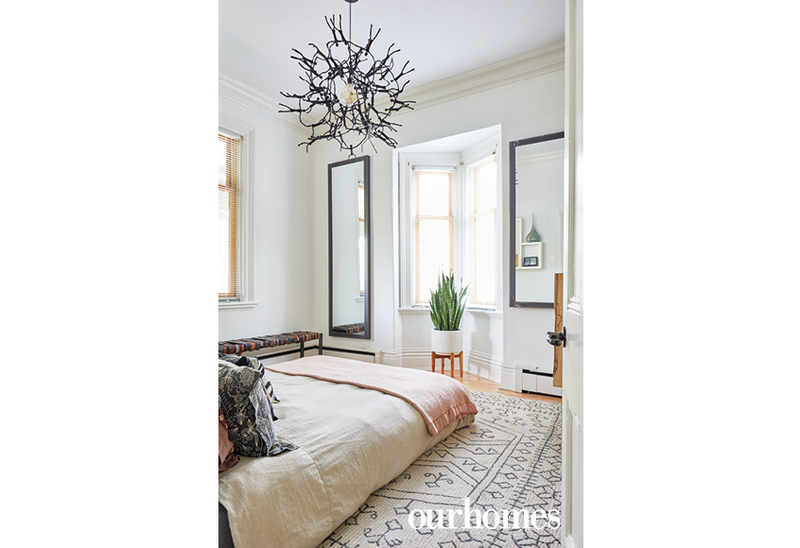 The airy guest room, painted in Oxford White, nails boho chic with its dhurrie rug and a twig chandelier. Sylvie and Andy with Sylvie’s mother, Cecile, left, enjoy summer sangria while one of the Roth’s three Westies enjoys his perch by the fire. 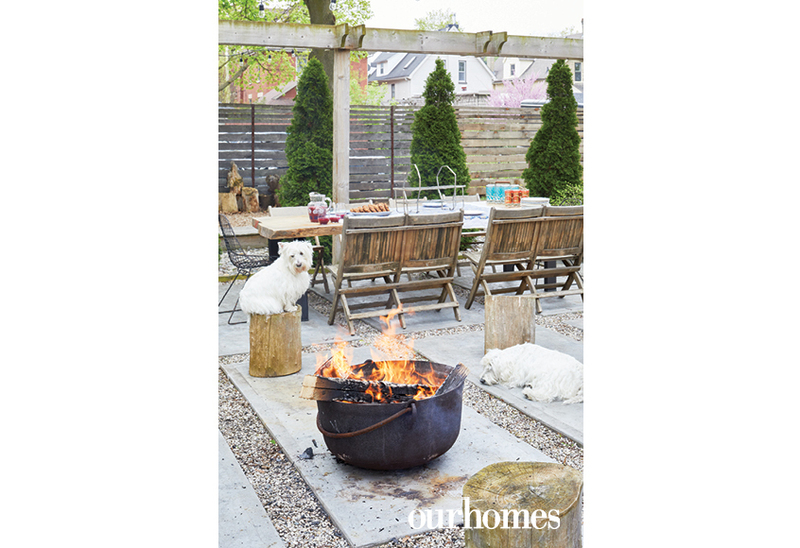 A fire bowl sits in the centre of a grid of concrete squares divided by pebble stone. 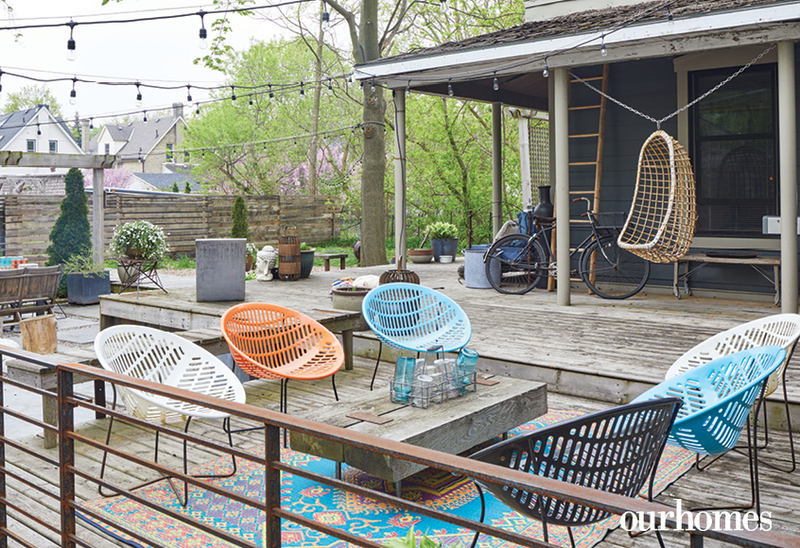 The oversize property, festooned with string lights and plenty of seating, is always at the ready for summer gatherings.